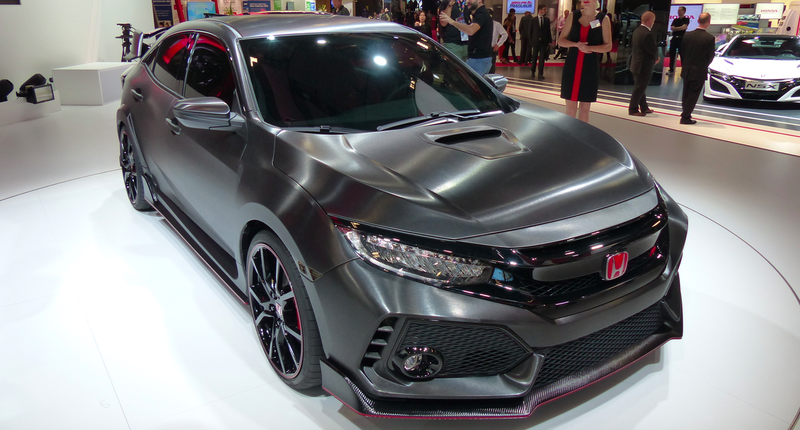 I’m at the Paris Motor show, so I’ve spent the past hour simply sitting next to the Honda Civic Type R and drooling. I also took a break from my salivary activities to take a couple pictures. Check them out. By now, day one of the motor show is winding down, so the Honda Civic Type R sits there in pavilion three all alone desperate for love and attention. Not to leave one of the most promising tuner cars in years in solitude, I hiked down there with my camera and gave the Type R the love it deserves. The paint is this matte gray finish that, in person, almost looks like brushed steel. I tried touching it, but the two 80-pound models nearby were very intimidating and wouldn’t let me get close to the beautiful Honda. The tires are 245mm wide all the way around, and the wing and front fender vent look very WRX STI-ish. The air intake in the hood seemed to be blocked off, and I noticed that the frontal grille openings are the same size as the 1.5-liter Honda Civic. In fact, the intercooler and radiator looked exactly the same, so I wouldn’t be surprised if it were just a 1.5-liter turbo Civic under the souped-up body panels.